It’s a gorgeous summer afternoon and the very last place you want to be is in your basement gym or packed inside a local gym that smells like stale sweat and dirty socks. Head outside to a local park instead, and try your hand at the following circuit workout that requires nothing more than a little imagination, your backpack, and a lot of energy! This full body routine can substitute for your gym workout on those days when you want to stay outside, when the gym is closed for whatever reason, or whenever you are traveling and have little access to equipment. If you are training for hiking or climbing and have a backpack handy, load it up with several water bottles or a gallon jug or two and you have a ready-made gym you can take with you anywhere. (Please note: water bottles are preferred to weight plates, dumbbells, or rocks as these all concentrate the load in too small an area and can pull on your trapezius muscles, not to mention wear out your pack. Water allows you to spread the weight more evenly and is far more comfortable, not to mention adjustable.) Please be sure that you already have a training base of at least 4-6 weeks before embarking on such a program as this one. Be prepared to get in a lot of work in a short amount of time. 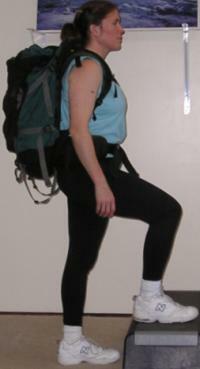 Warm-up (5 minutes): simply put your pack on and walk out the door! You can also jump in place (pretend you have a jump rope in your hands), jog, do jumping jacks, dance, skip, or walk up and down some stairs -- anything to increase your range of motion and prepare you for a more intense workout to come. 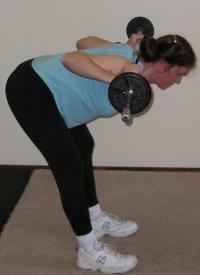 Circuit: large muscle group strength endurance training (20-60 minutes): alternate between 1-2 minutes of aerobic activity, using the same suggestions as above, stepping up and down on a single or multiple steps, or simply walking briskly to the next spot along your route with your pack on your back. Complete 1-2 sets of each of the ten strength exercises below, a minute of each, in the order set up below. Try not to stop during the workout. If you feel dizzy at any time, be sure to slow down and catch your breath or take sips of water, but keep moving to build up your endurance. 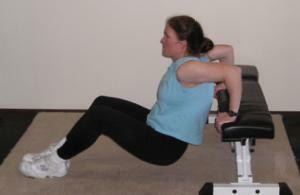 The way the circuit is set up, the emphasis alternates between upper and lower body. Once you have done a strength exercise, return to another 1-2 minutes of aerobic activity, and continue alternating back and forth until you have completed the circuit. If you do cardio for a minute in between one round of the circuit, your complete workout time will be just over 20 minutes. As time allows and you have enough energy, repeat the circuit from the beginning (twice through will take you 40-45 minutes) and as you build stamina, by adding time to each aerobic segment, you can increase your workout duration to an hour. Be sure to finish with five minutes of gentle aerobic activity (a walk with your backpack on is fine) and finish off with stretching to return your heart rate to normal and fully recover.